Why do so many progressive campaigns in the real world still use yesterday's technology? Campaigns over-spend on out-of-date software. Startups struggle to get new apps to candidates. Training is spotty. We can do better. DemLabs has engaged with campaigns, tech firms and political groups for over a year to learn what technology is needed and what's already available. We've piloted new tech and media approaches into campaigns. We've seen how hard it is for startups to sell solutions to progressive groups. How is it that startups in the commercial sector can innovate, get funding, grow rapidly and offer users better and cheaper apps? What can be learned from the business sector to streamline the flow of innovation? 1. The progressive ecosystem is fragmented with multiple gatekeepers and decision makers. 2. Funds are tight and spending is seasonal with the election cycles making it hard for many vendors to revise their apps. 3. Campaigns are tight on time, funds and the technical expertise needed to evaluate new solutions. 4.Campaign consultants often use what they know, which may not be the most cost effective and successful for current campaigns. 5. Software vendors are usually small with meager funding and limited sales resources. 1. 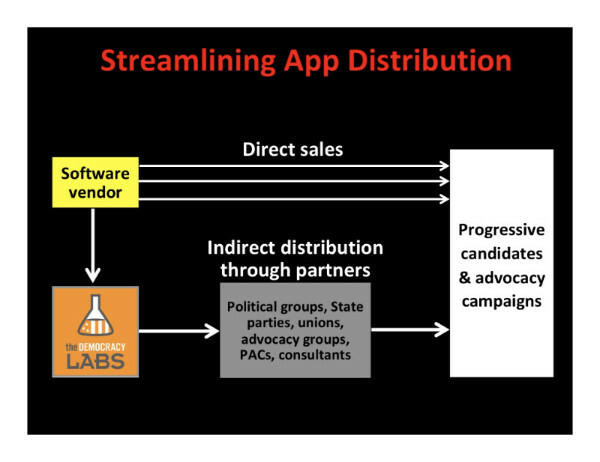 A scalable approach to get new technology to progressive campaigns through the institutions they already work with and they trust. 2. Startups focus on developing apps and use a distribution channel to supplement their own direct sales. 3. Upfront investment needs and ongoing cost of sales are lowered. 4. Centralized product training and support lowers costs further and speeds the rollout of innovative new solutions. Grassroots video collection - app for campaigns to collect video clips from their supporters and amplify through social media. (FlipGrid)Better technology is an equalizer. It enables more good candidates run for office even with little funding and lowers a campaign's fund-raising needs. Drop us a line if you'd like to learn about other solutions in the pipeline - or if you know of good app that needs distribution. The progressive front lines should always have the best tools!